Craig brought the Stanley Cup to the Alberta Children's Hospital. Hands up all of you who can name a National Hockey League player from Brunei. 'Where's Brunei,' some of you ask? It's a country found on the northern coast of the island of Borneo in Southeast Asia. Give up? How about the Penguins' Craig Adams! Although born in Seria, Brunei, he was raised in Calgary, Alberta, and that's where this adventure of August 21 takes place. 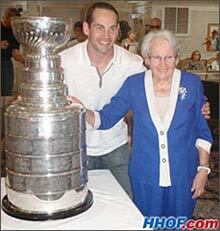 Craig brought the Stanley Cup to Manor Village where his grandmother lives. The Stanley Cup showed up at 8:00AM, and was taken by Craig to the Alberta Children's Hospital, where he took the Cup from room to room, visiting and cheering up the youngsters receiving treatment. Even those youngsters without a great deal of knowledge were smiling like the butcher's dog, knowing that they were in the presence of something  and someone  very important. 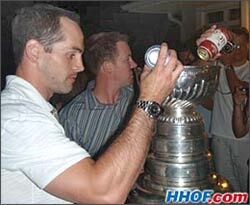 This was not the first time Craig Adams had enjoyed a day with the Stanley Cup. Almost exactly three years prior (August 24, 2006), Adams had brought the Cup home to Calgary after winning the championship with the Carolina Hurricanes. When he was drafted by the franchise, then known as the Hartford Whalers, he was the 223rd (and very last) selection in the 1996 NHL Entry Draft. Brunei? 9th round draft pick? Let's say Craig defied the odds to star in the NHL! Adams took the historic trophy back to the home of his parents, Hilary and Mike, where the extended family was also there to enjoy the celebration. His wife Anne was there with son Rhys and daughter Francesca, who was born on May 5 of this year. Craig's brother Gareth was there, too, as was Anne's father, Paul Cellucci, who served as Governor of Massachusetts from 1999 to 2001, then resigned to become the United States' Ambassador to Canada, a post he held from 2001 to 2005. A professional photographer took pictures of various incarnations of the Adams family. Craig took the Stanley Cup to Mount Royal Station, and was joined there by Andrew Ladd, a teammate with the Hurricanes in 2006 but now, a member of the Chicago Blacks. In 2006, Adams staged a road hockey game, but he wanted to try something different this time, so in light of the 2010 Olympics being held in Canada, Craig held his own miniature Olympic Games. This tournament featured three games  Bag-o (tossing bean bogs onto a platform), bocce and Bump Basketball. The winning team got to have their pictures taken with the Stanley Cup. The 2009 winner of the Adam-olympics was Craig's brother Gareth and his team (although there was almost a melee over a discrepancy in the standings)! A brief return to his parents' home preceded a visit to Manor Village, a residence for older adults, where his grandmother, Irene, lives. Grandma was so proud of Craig, and beamed as she introduced him to her many friends. After another quick stop at home, Craig took the family to the Wildwood Grill and Brew Pub to enjoy a Canadian-inspired meal. The menu included such fare as elk and bison. Patrons of the pub came by to meet Craig and see the Stanley Cup, and he was pleased to allow guests to get a picture of the legendary trophy. A party bus from BustLoose.com picked up the gang and took them to a friend's house, where they enjoyed the rest of the evening. The Stanley Cup was flown over to Europe, and on Friday, we'll celebrate with Miroslav Satan in another edition of the Stanley Cup Journal.